Sun, Mar 18, 2018, 09:26 pm SL Time, ColomboPage News Desk, Sri Lanka. Mar 18, Colombo: Sri Lanka's President Maithripala Sirisena says people's representatives should set an example to the public with their conduct and behavior to create a political culture with a high standard and quality. The President said this during a meeting with the Sri Lanka Freedom Party and United Peoples' Freedom Alliance members who secured victory at the last month's Local Government Elections at the President�s House in Colombo on Sunday. The President told the new councilors that they should fully contribute to resolve the people's issues in accordance with a timetable and be patient, attentive and principled and not leading to conflicts with the public. President Sirisena also pointed out the need to work without fraud and corruption to achieve development targets while listening to the public voice. He requested the Peoples' representatives to work with commitment for public service with quality views with a value. The President express confidence that the new representatives will strengthen the party to continue its political and development agenda properly and strongly fixing the shortcomings while not discouraged by the last local government election results. He requested them to take part in every local council meeting providing their quality ideas and suggestions and commit to public service. He also asked them to read books and newspapers and gain knowledge to achieve a better political future. The President assured that he will provide provisions for the development activities in the areas represented by the councilors and if necessary to give more financial assistance after assessing the progress. At the occasion, the local government representatives pledged to function in honest and committed manner for a clean political movement. 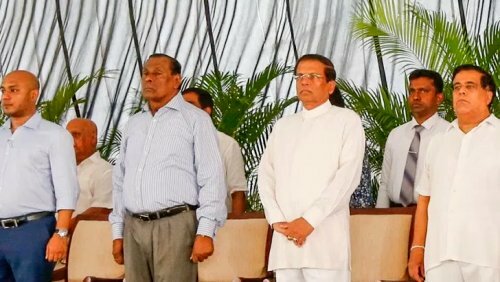 SLFP Senior Vice Chairman Nimal Siripala de Silva, General Secretary Duminda Dissanayake, UPFA General Secretary Mahinda Amaraweera and Minister Faizer Mustapha also expressed their views on the occasion.